Welcome to The Purring Peddler, a must read column for the stylish cat lady! The holiday that celebrates love is a mere two weeks away. We've chosen a handful of items purr-fect for showing that special human (or cat!) in your life that you adore them...or for dropping hints about what you'd like to receive! Of course you could always just cut out the middle man like I do and treat yourself...but that sort of defeats the purpose of the holiday, doesn't it? If your partner is lucky, they're one of the 3 people you care about ;) The fact that this quote fits me to a "T" is most likely why I typically spend Valentine's Day at home with my cat. And I'm perfectly fine with that. We need another cat bed at our house like I need another book but *OH* how I love this bed. I have zilch-zero-nada interest in football. All the Super Bowl means to me is that the NASCAR season is mere days away. But for the past several years the Puppy Bowl and Kitten Bowl have been annual traditions at my house. Hallmark's popular itty bittys® line lets you invite the star players into your home before the big game! 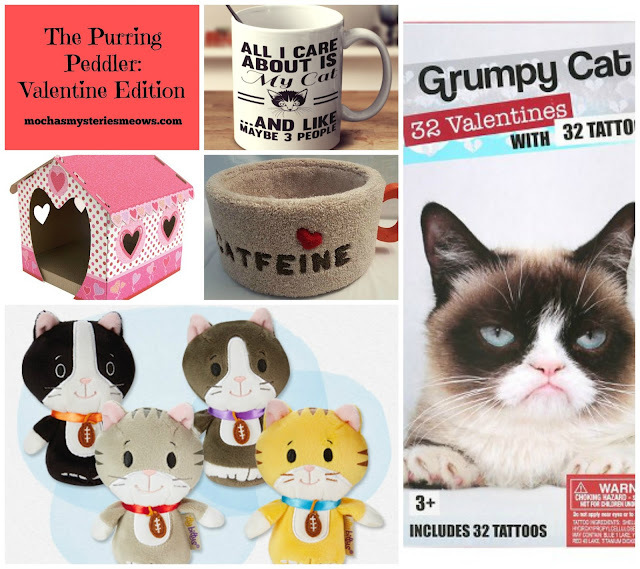 I love putting together these Purring Peddler posts and hope you enjoy them too! What kinds of things would you like to see featured here? Give me an excuse to stalk the online stores for purr-fect products to share! Disclaimer: I am not being compensated in any way for featuring these items, I just picked them out because they're pawsome! The coffee mug is mine!!!! We like the itty bitty kitten bowls best. Oh my goodness we want them all. That coffee mug is too cute and you know I love Grumpy. I love the mug! That is so true about me. I'm such an introvert sometimes! These are all really fun. :) Perhaps sometime you should do a version of this where Mudpie shows off her favorite things. The cat bed is just MP’s colors! Love the selection. I am so tempted!